To start with, there was no better bike than our Street Triple to base it on. It already had the advantage with a class-leading engine and awesome, focused looks. SUSPENSION: The Street Triple tunes you into every ride. Its steering geometry, handling balance and suspension ensures effortless agility, road-holding and ease-of-use, with thrills for every type of rider. For the ultimate in performance, the Street Triple R has uprated suspension, brakes and geometry to enhance sporty road and track riding. BRAKES, WHEELS, TIRES: Brakes aren’t just about outright power; control is vital too. The Triumph Street Triple’s four-piston Nissin calipers grip 310mm discs on lightweight, cast aluminium italic wheels, and are engineered to work in harmony with suspension and the overall motorcycle chassis balance. The sportier Street Triple R and RX use radially mounted four-piston Nissin callipers to integrate with enhanced suspension and chassis geometry. FRAME: With heritage from the Triumph Daytona 675 sports bike and echoing the ground-breaking 1995 T595 Daytona superbike, the Street Triple’s twin spar aluminium frame uses cutting-edge design to route incoming air through the headstock for maximum efficiency, as well as providing the perfect blend of rigidity and feel. The Street Triple R and RX feature a steeper head angle for extra steering response on sporty track and road riding. The Street Triple, Street Triple R and Street Triple RX feature an aluminium subframe, colour coded red on the Street Triple R and RX. SUSPENSION: Key to the Triumph Street Triple’s outstanding ride is its suspension. High quality upside down KYB 41mm forks and KYB rear shock are factory pre-set to optimum road settings for peace of mind. The Street Triple R and RX come with a full suite of adjustable preload, compression and rebound damping from upside down KYB 41mm forks and KYB rear shock, colour-coded to match the motorcycle’s styling enhancements. POWER AND PERFORMANCE: The Street Triple’s soulful, potent in-line three cylinder motor delivers thumping midrange torque of 68Nm and a howling 106PS peak power, for hard-charging acceleration all the way up to the screaming 12,500rpm redline, so you can get your kicks anytime, anywhere. TECHNOLOGY: It may be small and powerful, but it’s perfectly formed. The 675cc inline triple, already naturally balanced for smooth power, runs an additional balancer for vibration-free riding. Advanced fuel injection and engine management gives precise throttle control and supreme ease-of-use. EXHAUST: Located beneath the engine, the under-slung exhaust focuses weight close to the centre of gravity and adds to the Street Triple’s agility. The three-cylinder engine also generates evenly spaced exhaust pulses that harmonise combustion for maximum efficiency. STYLE: The Street Triple wears its stripped-back, fun-loving heart on its sleeve, from instantly recognisable twin headlights, across slash-style radiator cowls highlighting the three-cylinder engine, to its slender seat unit. The Street Triple R shows its sportier side with red radiator cowls, subframe and pin-striped wheels, showcasing Triumph’s obsession for quality and attention to detail. ABS: The Street Triple’s potent Nissin braking set-up is supported by Triumph’s sophisticated anti-lock brake system. The ABS modulator makes over 100 calculations per second working behind the scenes, and is unnoticeable in normal riding – but it’s there when you need it. 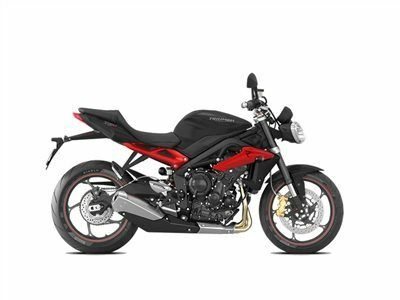 IMMOBILIZER: In common with all Triumphs, the Street Triple is protected at standstill by a coded key immobiliser system that disables the ignition if it detects an attempt to turn or force the ignition switch without the presence of the electronically coded correct key. INSTRUMENTS: The Street Triple’s clocks are a classy mix of analogue tachometer with a fully-featured LCD multi-functional trip computer including digital speedo, fuel gauge, twin trip mileage, lap timer, programmable gear change lights, service interval announcement display and switchable ABS.